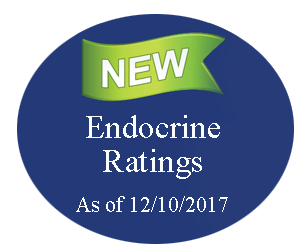 On November 2nd, 2017, the VA published their final changes to the ratings for conditions of the Endocrine System. Of the nine sets of changes that have been proposed as part of the VA’s complete rewrite of the VASRD, this is only the third to have been made official and final. The other finalized changes were to the ratings for Mental Disorders in 2014 and the ratings for Dental and Oral Conditions earlier this year. Other proposed changes include the Hemic and Lymphatic System, the Female Reproductive System, The Eyes, the Skin, the Genitourinary System, and the Musculoskeletal System. The following changes will go into effect December 10, 2017, and we’ll officially update all the information on our website at that time. Any Endocrine System conditions rated on or after December 10th will be based on these new ratings. Below are the final changes for the ratings of the Endocrine System. They are fairly extensive, with the majority of codes having some sort of change, so I’ll discuss each code in order. The smaller, indented parts are the codes as they are now. I’ll then list the code as it will be under the final changes and then discuss the differences. Click on the code number to be taken to the discussion of that code on our site. The majority of the following changes are based on one very important fact, so I won’t address it in detail every single time it comes into play. The fact: The majority of symptoms caused by endocrine conditions can be fully resolved by medications or other treatments. Because of this, a 100% rating based on really severe symptoms won’t be given anymore for these conditions since the symptoms can be completely resolved by treatment. This isn’t really a new phenomenon—the treatments have been around for a while—but they are so successful that having higher ratings is no longer logical since they are never used. Based on this fact, you’ll see that the higher ratings for almost every code have been discarded and alternative rating options given for those extremely rare cases when symptoms are not fully resolved by medications or the medications themselves cause other conditions. Note that the final changes also get rid of some (not all) of the 10% minimum ratings for conditions that require constant medication to control. This is pretty significant for many of our veterans who have these 10% ratings. The VA’s reasoning is that if something can be successfully treated, then it is no longer a real disability, and thus should not be ratable. No symptoms = no disability = no rating. This is the logic that is used throughout the VASRD, but for some reason, the Endocrine System has still had those 10% minimums. These final changes bring this section more in the line with the principles in the rest of the VASRD. Code 7900: Hyperthyroidism occurs when the thyroid produces too many hormones. This causes all the functions in the body to speed up, which can cause symptoms like tremors, hair loss, nervousness and anxiety, rapid heart rate, eye swelling, vomiting, and muscle weakness. Most severely symptomatic patients would be treated to stop the excessive production of thyroid hormones, therefore any permanent rating over 10% is very unusual. If the only significant symptom of this condition is heart disease, then it can be rated under code 7008 if that would produce a higher rating than one under this code. Likewise, if the only significant symptom is problems with the eyes, then rate it under the eye condition closest to the symptom. If the thyroid is swollen, the heart rate is faster than 100 beats per minute, there are eye problems, weakness, weight loss and other symptoms of the cardiovascular system, nervous system, or gastrointestinal system then it is rated 100%. If you have unstable emotions, a fast heart rate, you get tired and weak easily, and have an increased pulse or blood pressure, it is rated 60%. If you have a fast heart rate, tremors (most often in the hands), and an increased pulse or blood pressure, it is rated 30%. If you have an occasionally fast heart rate and tremors, or if constant medication is required to control the condition then it is rated 10%. -Final- Code 7900: Hyperthyroidism, including Graves’ disease, occurs when the thyroid produces too many hormones. This causes all the functions in the body to speed up, which can cause symptoms like tremors, hair loss, nervousness and anxiety, rapid heart rate, eye swelling, vomiting, and muscle weakness. It is rated 30% for the first 6 months after being diagnosed. After 6 months, the condition is then re-evaluated and rated on any remaining symptoms or complications from the medication. Each distinct body part that is affected can be rated separately. For example, any heart symptoms are rated under code 7008, hyperthyroid heart disease, and any eye conditions are rated under the most appropriate eye code (i.e. diplopia, code 6090), etc. Any symptoms caused by Graves’ disease are rated separately, even without the presence of hyperthyroidism. The VA chose to assign a 30% rating for the first 6 months because all symptoms usually resolve within the first 3 – 6 months after diagnosis and the beginning of treatment. If there are any symptoms left over, which would be rare, then the VA provides alternative rating options. The other main change for this code is the addition of Graves’ disease in the title. Graves’ disease is one of the main causes of hyperthyroidism, and so should always be rated under this code. The VA decided to add it to the name of the code to eliminate any confusion about where Graves’ disease should be rated, but this does not limit this code to only Graves’ disease. Any type of hyperthyroidism is still rated under this code. Similarly, Graves’ disease can cause symptoms in other areas without causing hyperthyroidism. If there are other symptoms caused by Graves’ disease, they can always be rated separately, even if hyperthyroidism is not present. Code 7901: A toxic adenoma of the thyroid gland is a tumor in the thyroid that causes it to produce too many hormones. This causes all the functions in the body to speed up, which can cause symptoms like tremors, hair loss, nervousness and anxiety, rapid heart rate, eye swelling, vomiting, and muscle weakness. Most severely symptomatic patients would be treated to stop the excessive production of thyroid hormone, therefore any permanent rating over 10% is very unusual. If the only significant symptom of this condition is heart disease, then it can be rated under code 7008 if that would produce a higher rating than one under this code. Likewise, if the only significant symptom is problems with the eyes, then rate under the eye condition closest to the symptom. The ratings: If the thyroid is swollen, the heart rate is faster than 100 beats per minute, there are eye problems, weakness, weight loss and other symptoms of the cardiovascular system, nervous system, or gastrointestinal system, then it is rated 100%. -Final- Code 7901: Toxic thyroid enlargement is any condition that causes the thyroid to become enlarged (tumors, nodules, swelling, etc.) and produce too many hormones (hyperthyroidism). It is rated as hyperthyroidism under code 7900. If the enlargement of the thyroid causes disfigurement of the neck, then an additional rating can be given under code 7800. Currently, 7901 is limited to tumors (“adenomas”) as the main cause of the swelling. With other more common causes, like nodules, the VA decided to remove the tumor-specific text and broaden this to include any enlargement of the thyroid gland that causes the thyroid to produce too many hormones (toxic). Since the result of this condition is hyperthyroidism, the VA also decided to simply have the condition rated under the code for hyperthyroidism instead of repeating the rating requirements here. Code 7902: A nontoxic adenoma of the thyroid gland is a tumor that does not cause the thyroid to over-produce hormones. If there is disfigurement of the head or neck, it is rated 20%. Without disfigurement, it is rated 0%. If the tumor causes problems from pushing on the organs or bodily systems around it, then it can be rated based on the problems it causes if their ratings would give a higher rating than 20%. This condition can only be rated once, however. A rating under this code and a rating under a code for a symptom the tumor causes is not allowed. -Final- Code 7902: Nontoxic thyroid enlargement is any condition that causes the thyroid to become enlarged (tumors, nodules, swelling, etc. ), but does not cause it to produce too many hormones. If it causes problems from pushing on the organs or bodily systems around it, then it can be rated based on the problems it causes. For example, if it pushes on the esophagus and makes it hard to swallow, then it can be rated as a stricture of the esophagus, code 7203. If it also causes disfigurement of the neck, then it can be given an additional rating under code 7800. Like the previous code, the VA decided to broaden this to include any cause for enlargement, not just tumors. Similarly, this code currently only allows a single rating for its effects and disfigurement, not both. Since both can be present and disabling, the VA is changing this so that both can be given separate ratings. Code 7903: Hypothyroidism is the opposite of hyperthyroidism in that the thyroid does not produce enough thyroid hormone. This can cause symptoms like constipation, weight gain, tiredness, depression, and muscle cramps. Once again, this condition is very easy to treat with medications (Synthroid, Cytomel, levothyroxine), which generally satisfactorily control all the symptoms. A permanent rating over 10% is again unusual. If you cannot stand the cold, have muscle weakness, mental issues (depression, dementia, etc. ), a slow heart rate (less than 60 beats per minute), drowsiness, and other problems with the heart, it is rated 100%. If there is muscle weakness, mental issues and weight gain, it is rated 60%. If you are easily tired, constipated, and your mind is slow and sluggish, then it is rated 30%. If you are easily tired or if you require constant medication, then it is rated 10%. -Final- Code 7903: Hypothyroidism is the opposite of hyperthyroidism in that the thyroid does not produce enough thyroid hormone. This can cause symptoms like constipation, weight gain, tiredness, depression, and muscle cramps, but if left undiagnosed and untreated can cause myxedema, a life-threatening condition with symptoms including muscle weakness, slowing of thought (stupor), dementia, heart problems (most commonly hypotension, bradycardia, and pericardial effusion), and cold intolerance. A 100% rating is given the entire time myxedema is present and for the first 6 months after the physician determines that the condition is stabilized. All other cases of hypothyroidism are rated 30% for the first 6 months after diagnosis. After the 6-month waiting periods, all cases of hypothyroidism are rated on any remaining symptoms. Eye problems, like blurred vision or diplopia, can be rated additionally to other ratings given under this code. Myxedema is extremely rare now that we have tools available to diagnose hypothyroidism early enough to avoid it, but it can still happen if a case does somehow go undiagnosed or untreated (only happens in about 0.1% of all cases). Thus instead of completely getting rid of the 100% rating, the VA is adjusting it so that it still covers those cases if they arise. All other symptoms should resolve within 6 months of treatment. Code 7904: Hyperparathyroidism occurs when the parathyroid gland produces too many hormones. There are two kinds of hyperparathyroidism: primary and secondary. Primary is a result of the glands themselves malfunctioning. This kind has very few symptoms but can include symptoms like depression, fatigue, bone pain, and muscle soreness. Secondary is a result of low Vitamin D levels. Symptoms include bone conditions like osteomalacia. If there are kidney stones, weakness, loss of calcium in the bones, and gastrointestinal symptoms: vomiting, constipation, weight loss, nausea, anorexia, or a peptic ulcer, it is rated 100%. If there are gastrointestinal symptoms and weakness, it’s rated 60%. If constant medication is required to control the condition, it is rated 10%. If surgery was performed to fix this condition, then the condition can be rated under this code or under any code for a remaining symptom or complication, whichever gives the highest rating. Only one rating can be given. -Final- Code 7904: Hyperparathyroidism occurs when the parathyroid gland produces too many hormones. There are two kinds of hyperparathyroidism: primary and secondary. Primary is a result of the glands themselves malfunctioning. This kind has very few symptoms but can include symptoms like depression, fatigue, bone pain, and muscle soreness. Secondary is a result of low Vitamin D levels. Symptoms include bone conditions like osteomalacia. This 60% rating will continue for 6 months after treatment begins or until surgery is performed. When surgery is performed, a 100% rating will be given and will continue for the first 6 months following the surgery. After the 6-month period following either surgery or other treatment, any remaining symptoms (like kidney stones, vision problems, heart problems, etc.) will be rated separately under the appropriate codes unless they are included in the following 10% rating below. A 10% rating is given if symptoms including nausea, anorexia, fatigue, or constipation are present despite surgery, or if constant medication is required to control the symptoms and surgery cannot be performed. A 0% rating is given if there are no symptoms. Unlike some of the other endocrine conditions, symptoms are more likely to persist even after treatment in some cases of hyperparathyroidism, so the VA decided to keep a 10% option available for any mild, lasting symptoms, or for symptoms that could be controlled by medication but weren’t serious enough yet for surgery. Code 7905: Hypoparathyroidism occurs when the parathyroid glands produce too few hormones. This causes low levels of calcium in the blood and can cause symptoms like cramping, muscle aches, muscle twitches, headaches, and fatigue. This condition can occur as a side effect from thyroid surgery. If there are severe muscle twitches, spasms, cramping throughout the body or wheezing in the throat, and either cataracts in the eyes or pressure inside the skull from brain swelling, it is rated 100%. If there is paresthesia in any of the limbs or around the mouth with cataracts in the eyes or pressure inside the skull, or if there are severe muscle twitches, spasms, cramping or wheezing, it is rated 60%. If constant medication is required to control the condition, it is rated 10%. -Final- Code 7905: Hypoparathyroidism occurs when the parathyroid glands produce too few hormones. This causes low levels of calcium in the blood and can cause symptoms like cramping, muscle aches, muscle twitches, headaches, and fatigue. This condition can occur as a side effect from thyroid surgery. This condition is rated 100% for the first 3 months after diagnosis. It is then rated on any remaining symptoms, like kidney stones, cataracts, congestive heart failure, or any decrease in renal function. The main changes to this code are again just to compensate for the fact that most of these symptoms are properly resolved with medications. -NEW CODE- Code 7906: Thyroiditis occurs when the thyroid gland becomes irritated and swells. It can cause no symptoms at all, or result in either hyperthyroidism or hypothyroidism. If it causes no symptoms, then it is rated 0% under this code. If it causes hyperthyroidism or hypothyroidism, it is rated under their respective codes. This is a brand new code that the VA is creating. Since any symptoms would be covered under another code, it is a little odd for them to add an entirely new code for this condition. Their reasoning, however, is pretty solid. If diagnosed with thyroiditis, even when no symptoms are present, the condition should be regularly monitored. By allowing it a 0% rating under this code, it ensures that it is eligible for VA healthcare. The condition can then be properly monitored by the VA, and they will be able to easily both treat and update the necessary ratings for the condition should any problems arise in the future. Code 7907: Cushing’s syndrome occurs when there is too much cortisol in the body. Symptoms include rapid weight gain, excessive sweating, easy bruising, weakness, high blood pressure, and more. This condition is most often caused by either a tumor in the pituitary gland (“Cushing’s disease”) or by the prolonged use of steroids to treat other conditions. If it is an active disease that is getting progressively worse and it causes muscle weakness, osteoporosis, high blood pressure, and the swelling or enlargement of the pituitary or adrenal gland, it is rated 100%. If it is not getting worse and there is muscle weakness and the enlargement of the pituitary or adrenal gland, it is rated 60%. If it causes obesity, a significantly round face caused by weight gain (“moon face”), stretch marks, fragile veins or arteries, and glucose intolerance (a pre-diabetic condition), it is rated 30%. If the condition is under control or is gone, then left over symptoms or complications are each rated separately. -Final- Code 7907: Cushing’s syndrome occurs when there is too much cortisol in the body. Symptoms include rapid weight gain, excessive sweating, bruising easily, weakness, high blood pressure, and more. This condition is most often caused by either a tumor in the pituitary gland (“Cushing’s disease”) or by the prolonged use of steroids to treat other conditions. If it is an active disease that is getting progressively worse and it causes osteoporosis, high blood pressure, and muscle wasting that makes it impossible to rise from a squatting position or a deep chair, climb stairs, or raise your arms, it is rated 100%. If it is no longer getting worse, but there is still muscle wasting that makes it impossible to rise from a squatting position or a deep chair, climb stairs, or raise your arms, it is rated 60%. If it causes obesity, a significantly round face caused by weight gain (“moon face”), stretch marks, fragile veins or arteries, and glucose intolerance (a pre-diabetic condition), it is rated 30%. These ratings are all given for the first 6 months following diagnosis, after which time any left over symptoms or complications are each rated separately. Overall, this code isn’t changing much. They decided to more clearly specify some of the rating requirements, like swapping “muscle weakness” for the inability to stand up, etc. They also got rid of the requirement of gland enlargement, since many cases do not have enlargement, but are still very serious. The final change was simply for these ratings to only last for the first 6 months of treatment, since treatment will satisfactorily resolve most symptoms. The remaining ones can then be rated separately. Code 7908: Acromegaly is a condition where the pituitary gland produces too much growth hormone. This can cause severe disfigurement and gigantism. If there is pressure in the skull, which causes problems with things like vision, diseases in the joints, glucose intolerance (hyperglycemia), and either high blood pressure or swelling of the heart, it is rated 100%. If there are diseases in the joints, glucose intolerance, and high blood pressure, it is rated 60%. If there is significant over-growth in the limbs or long bones and an enlarged sella turcica, it is rated 30%. -Final- Code 7908: Acromegaly is a condition where the pituitary gland produces too much growth hormone. This can cause severe disfigurement and gigantism. If there is pressure in the skull, which causes problems with things like vision, diseases in the joints, glucose intolerance (hyperglycemia), and either high blood pressure or swelling of the heart, it is rated 100%. If there are diseases in the joints, glucose intolerance, and high blood pressure, it is rated 60%. If there is significant over-growth in the limbs or long bones, it is rated 30%. The only change to this code was to remove the requirement for a large sella turcica to qualify for a 30% rating. If the condition is caused by a tumor, then the sella turcica is often enlarged, but the condition can be caused by other things that do not involve an enlarged sella turcica. Thus, to ensure that all conditions are properly rated, this requirement has been removed. Code 7909: Diabetes insipidus is completely different from diabetes mellitus. It is either caused by the body not producing enough antidiuretic hormone or by the kidneys not recognizing and responding properly to that hormone. Without this hormone, much higher levels of water in the body are filtered out through the urine. It causes polyuria. If the condition causes polyuria with almost continuous thirst and three or more episodes during the past year of dehydration requiring a replacement of liquids through IV, then it is rated 100%. If the condition causes polyuria with almost continuous thirst and one or two episodes of dehydration requiring a replacement of liquids through IV during the past year, then it is rated 60%. If the condition causes polyuria with almost continuous thirst and one or more episodes of dehydration during the past year that did not require IV treatments, it is rated 40%. If the condition causes polyuria with almost continuous thirst but no episodes of dehydration, it is rated 20%. -Final- Code 7909: Diabetes insipidus is completely different from diabetes mellitus. It is either caused by the body not producing enough antidiuretic hormone or by the kidneys not recognizing and responding properly to that hormone. Without this hormone, much higher levels of water in the body are filtered out through the urine. It causes polyuria. This condition is rated 30% for the first 3 months after diagnosis. At that point, if there is still polyuria that requires constant hormone medication, it is rated 10%. All other remaining symptoms are rated separately. Most cases of diabetes insipidus resolve fairly quickly. This is rarely a long-lasting disease and rarely causes incredibly severe symptoms. Thus, the VA is getting rid of all the current rating requirements and replacing them with more flexible ratings that can be better adjusted on a case-by-case basis. The VA allows for a short period of time when the condition will be rated 30% in order to determine whether or not the condition will become chronic or improve with treatment. After this time, it will then be rated as needed. Code 7911: Addison’s disease is a condition where the adrenal glands do not produce enough steroid hormones. If this disease is caused by a tuberculosis infection, please see the Tuberculosis page. For this code, a “crisis” occurs if arteries and veins in the limbs collapse and blood can no longer circulate throughout the limbs. This is accompanied by extremely low blood pressure and severe shock. Other symptoms can include nausea, vomiting, anorexia, dehydration, severe weakness, pain in the stomach, legs, and back, fever, and seriously limited brain functioning which could lead to coma and death. Likewise, an “episode” is not as severe as a crisis. The arteries and veins do not collapse, but symptoms may include anorexia, nausea, vomiting, diarrhea, dehydration, weakness, low blood pressure, low blood sugar, and a slowing of mental functioning. The ratings: If there were 4 or more crises during the past year, it is rated 60%. If there were 3 crises or 5 or more episodes during the past year, it is rated 40%. If there were 1 or 2 crises during the past year, 2 to 4 episodes during the past year, weakness and fatigability, or if corticosteroids are required to control the condition, it is rated 20%. This code is not really changing. They do specify that they are changing the official name from “adrenal cortical hypofunction” to the more widely used “adrenocortical insufficiency” but the condition is still Addison’s disease, and none of the rating requirements are changing at all. Code 7912: Pluriglandular syndrome is any condition that affects multiple glands of the endocrine system at the same time. This condition is rated on the main symptoms it causes. So, if it is tuberculosis that affects numerous glands, then it is rated based on the tuberculosis rating systems. Likewise, if it mainly causes high blood pressure problems, rate it under code 7101. The final code for this condition will look like this: 7912-7101. The first four-digit code defines the condition as pluriglandular, and the second four-digit code tells how it is rated. -Final- Code 7912: Polyglandular syndrome (including multiple endocrine neoplasia and autoimmune polyglandular syndrome) covers any condition that affects multiple glands of the endocrine system at the same time. This condition is rated on the main symptoms it causes. So, if it causes diabetes mellitus, it is rated under code 7913. Similarly, if it causes hyperthyroidism, hypothyroidism, hypoparathyroidism, Addison’s disease, or any other condition, it is rated under that condition’s code. “Polyglandular” is now more commonly used than “pluriglandular,” so the name has been changed. The VA also wants to make sure that these two specific conditions (multiple endocrine neoplasia and autoimmune polyglandular syndrome) were rated under this code, so they included them in the title, but the code is not limited to just these two conditions. Finally, the VA wants to make sure that these specific conditions were listed as possible rating options since they are the ones most commonly seen in cases of polyglandular syndrome. The examples we had previously were not dictated by the VASRD, but just examples we put in to help demonstrate the rating idea. Code 7913: Diabetes mellitus is the condition that most of us think of as just diabetes. It occurs either when the pancreas does not produce enough insulin (Type 1), or when the cells do not respond properly to insulin (Type 2). Type 3 diabetes can occur during pregnancy, but this condition resolves after the birth and is not ratable. Diabetes can affect many different organs including the heart, eyes, and kidneys. It can cause strokes, loss of blood flow to the arms and legs, and nerve dysfunction. It usually takes 10 to 20 years for these secondary conditions to develop. Note: When rating diabetes mellitus, keep in mind that the secondary conditions of diabetes can be rated separately as long as they are not part of the requirement for a 100% rating. So, if the diabetes is severe enough to warrant a 100% rating under this code, any other conditions that are caused by the diabetes cannot be separately rated. If the diabetes only warrants a 60% rating or lower, however, those other conditions can be rated separately. Diabetes is rated 100% if all of the following circumstances are present: 1) It requires an insulin injection more than once a day, a restricted diet, and a low physical activity level; 2) It causes three or more hospitalizations each year or requires weekly visits to a care provider; 3) It causes continuous weight loss and weakness. A 60% rating is given if the condition requires or causes all of the following: 1) insulin; 2) a restricted diet; 3) a low physical activity level; 4) one or two hospitalizations each year or two visits a month to a care provider; 5) minor side effects that would not make a person unemployable without the diabetes. If the condition requires insulin, a restricted diet, and a low physical activity level, then it is rated 40%. If the condition requires insulin and a restricted diet, or requires medication taken by mouth and a restricted diet, it is rated 20%. If it can be managed by a restricted diet alone, it is rated 10%. The change to this code is pretty simple, so it’ll be clearer for me to just discuss it rather than reproduce it in the code itself. The majority of this code will stay the same, but for a 20%, 40%, and 60% rating, it is specified that they must require at least one or more insulin injections each day. Right now, it just states that these ratings require insulin, but doesn’t say how often. They must have one injection per day under the final changes. No changes are being made to codes 7914, 7915, 7916, 7917, and 7918. Code 7919: C-cell hyperplasia of the thyroid is a condition where the C-cells that produce calcitonin in the thyroid grow abnormally into a cancer. If the cancer is active, it is rated 100%. This 100% rating continues for the first 6 months after the last treatment of procedure. It is then reevaluated. If it is no longer active, then any left over symptoms or complications are rated separately on the function they affect. So if the condition caused high blood pressure, then it would be rated separately. -Final- Code 7919: C-cell hyperplasia of the thyroid is a condition where the C-cells that produce calcitonin in the thyroid grow abnormally into a cancer. If it is treated with chemotherapy, it is rated under code 7914. If surgery is performed and chemo is not required, then it is rated under code 7903. The VA is making the analogous rating options more specific for this code in order to more fully cover all the possible treatments/symptoms of this condition. Code 7008: Hyperthyroid heart disease occurs when the thyroid produces too much thyroid hormone. This can affect the blood pressure, how the heart consumes oxygen, and how much blood the heart can pump. It can be rated only under code 7900 for hyperthyroidism unless atrial fibrillation is present. If it is present, then it can either be rated under code 7900 or under code 7010 (superventricular arrhythmias), whichever gives the higher rating. -Final- Code 7008: Hyperthyroid heart disease occurs when the thyroid produces too much thyroid hormone. This can affect the blood pressure, how the heart consumes oxygen, and how much blood the heart can pump. This condition is rated on whichever heart code best describes the overall condition. Although it is not a part of the Endocrine System, the VA is changing this heart code because it is directly caused by an endocrine condition. The current code only allows heart disease caused by thyroid malfunction to be rated separately under a heart code if atrial fibrillation is present. Thyroid malfunction, however, can cause numerous heart problems. To then allow for any type of heart problem caused by thyroid malfunction to be properly rated, the VA is getting rid of this limitation and allowing any hyperthyroid heart disease to be rated appropriately under the best code for it. The VA has officially started their renovation of the VA appeals process—hooray! However, it isn’t quite time to celebrate for everyone. The VA’s new RAMP (“Rapid Appeals Modernization Program”) will only be available by invitation until the full program is implemented sometime before February 2019. Starting this month (November 2017), the VA will be sending out RAMP invitations to eligible veterans with pending VA appeals. The invites won’t go out to everyone, so even if you are “eligible” and have had your appeal pending for a while, it doesn’t mean you’ll get one. If you have not yet submitted an appeal, then you can submit your appeal using the current VA appeals process. You cannot yet apply directly to the RAMP program as invitations are only going out to veterans who already have their VA appeals pending. 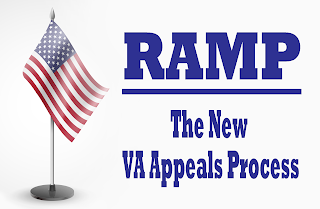 Sometime before February 2019, the VA will open up the RAMP program to new appeals as well, but there is no way to know exactly when, so you have to still apply via the current system. Although, once your appeal is in the system and pending, you might get a RAMP invite. If you have already submitted a VA appeal, then just sit back and wait. You might receive a RAMP invitation sometime this coming year, but there is nothing that you can actively do right now. If you receive a RAMP invitation, then you have the option to choose whether to participate in the new RAMP process or to leave your appeal in the old process. Either way could be fine, depending on your case, and it is completely up to you. 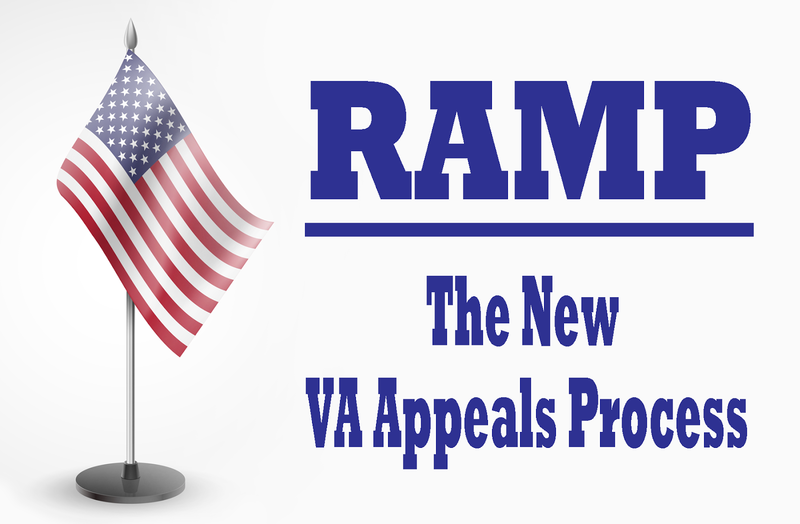 The goal of RAMP is to make the VA appeals process faster, so it may be in your best interest to switch to RAMP. However, if you’ve been pending for awhile and your case is more complicated, it may be better to stay. Under RAMP, you have the ability to choose one of three “lanes” to put your appeal in. If you pick the best lane for your type of case, then it will be reviewed much more quickly than the current system. If, however, you pick the wrong lane or it is too complicated for a particular lane, it will then be transferred to the other lane or the BVA’s longer line. Even under RAMP, more complicated cases must go to the Board of Veterans Appeals (BVA), but the BVA will not be reviewing any RAMP cases until February 2019. Until then, the BVA will simply focus on the pending appeals in the current system. 2. New Evidence. This lane is for claims that have new evidence that wasn’t submitted with the original claim. If the VA made a decision about your case, but didn’t have all the evidence and you’d like to submit additional evidence, then this is the lane for you. Only submit to this lane if you have new evidence regarding your conditions that the VA has not yet seen. 3. The Board. This lane sends a case directly to the Board of Veterans’ Appeals (BVA). Again, however, the BVA will not be reviewing cases under RAMP until February 2019 as they are already overwhelmed under the current system and need to focus on that. So until the RAMP program is fully implemented, only the first two lanes will be beneficial. If you decide to participate in the RAMP program under one of the first two lanes, and disagree with their decision, then you can appeal directly to the BVA. As the BVA will be focusing on the current appeals, it is definitely fine to choose to not participate in the RAMP program. Depending on your case, however, the RAMP program may be a godsend. In reality, the majority of VA appeals are fairly straightforward cases that are simply bogged down in the overload of the current system. This new RAMP system will allow those cases to be separated out and reviewed more quickly. Ultimately, the VA’s new RAMP program should make the VA appeals process much better in the long run by dividing the labor among three lanes instead of it all landing on the BVA. However, it will take some time to fully implement and be available to everyone. Hopefully during that time, they’ll be able to work out the kinks and have a solid system ready to go by February 2019.